I was staggered to get the news that Jack Joyce, Rogue founder and one of the central pioneers of craft brewing in Oregon, died yesterday. 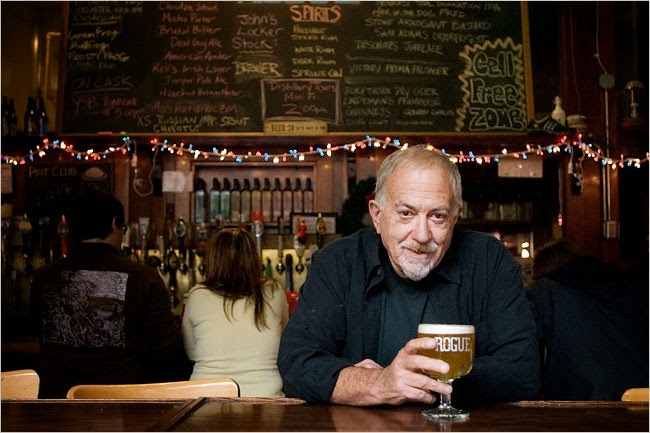 Jack brought a world of experience to Rogue that few of the founding craft brewers could match. In addition to a background in law, he was also an executive at Nike. He was in charge of production during the introduction of Air Jordans and had a box seat view of what truly spectacular branding could do for a company. When he founded Rogue, Jack brought a savvy to the brand side of the business that probably only Jim Koch could match. Until Jack came along, breweries cast their eyes backward in time for branding inspiration. The western-themed look of Sierra Nevada, the Germanic touches like Widmer adopted, these were more common. Others went for a naturalistic theme, like BridgePort's iconic fish and birds. But Jack looked forward and saw what craft brewing represented to the beer industry--a challenge. Now almost every brewery adopts the pose of iconoclastic outsider, but they are actually just following Jack's lead. He was the first to brand a craft brewery as a rebel, and he helped define the industry. On a personal note, Jack was always kind to me, no matter what I was writing on the blog. Sometimes he'd read something I'd written and I'd get a gnomic phone message with his gravely, terse voice. I would have to try to crack the code by figuring out what the 19 words he spoke related to. He sent me notes from time to time as well, and last year I got a Christmas card from him. It was smart business not to alienate writers, but I never sensed that was his motivation. He loved the brewery, and he was a strong advocate for it. His enthusiasm was infectious, and your affection for him couldn't help but translate to the brewery. I have no doubt that he left the world feeling that he'd built America's best brewery, and I will raise a pint high to his memory tonight. He was an original and Oregon is a little less Roguish without him. Update: Kendall Jones has a nice remembrance. Thank you for telling us about his marketing experience. The "Rogue" label makes more sense now. I appreciate that the brewery knows its identity, and Joyce was key in creating that business spirit. Is IPA the Most Popular Style?